Jewel orchids are truly the gems of the orchid family. While most orchids are grown for their beautiful flowers, jewel orchids are primarily grown for their spectacular foliage. Most species of jewel orchids produce insignificant flowers but a few, such as Ludisia discolor, produce spikes of small but attractive white and yellow flowers which are also pleasantly fragrant. Most of the jewel orchids are found in the warm, humid tropical rain forests of Southeast Asia and throughout the islands of the Indo Pacific region including the remote rain forests of New Guinea and Borneo. There they grow in the leaf litter under the shade of large tropical trees. A few species in the genus Goodyera grow in the cooler highland cloud forests of Southeast Asia at elevations of 3000 to 7500 feet. When grown as houseplants the challenge is to maintain high humidity. The obvious solution is to grow them in a terrarium or Wardian case. There are however, other options. Many people successfully grow them in their bathroom and have created stunning decorative displays that compliment their existing decor.Regardless of how you display them we think you will find the jewel orchids enchanting and rewarding. 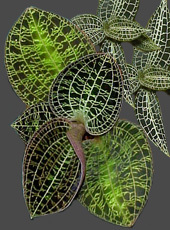 Browse through our Jewel Orchid selections below and click on any image to see a close up.